Sometimes I find myself wondering what it must have been like to read a true classic—kids' or adults' variety—right as it first came out, when no one knew, for sure, that it was a classic yet. When parents and kids cracked the binding on the first copies of Where the Wild Things Are back in 1963, or Harry Potter and the Sorcerer's Stone in 1998 (okay, okay, Philosopher's Stone in 1997 in the U.K., I know), was there a dawning awareness that this was something special, not just for that year's crop of books, but for a long, long time to come—forever, really? I think there must have been, because I recently had that feeling myself upon reading The High-Skies Adventures of Blue Jay the Pirate, a new book by Scott Nash, with my elder son. 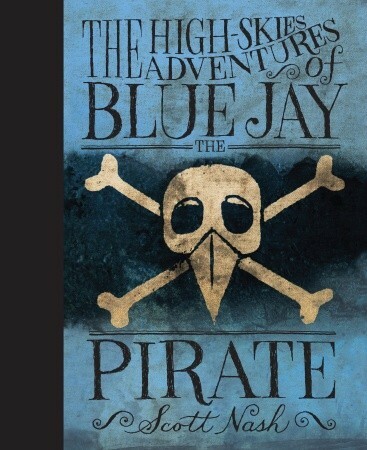 It's a pirate book, with our protagonist, Blue Jay, a good pirate captain—but the twist is, all of the pirates (and indeed, most of the book's characters) are birds, and their ship, the Grosbeak, rides not the high seas, but the winds and currents of the air. And Nash—whose background before he got into children's books was in design and branding, including the original Nickelodeon logo—is one of those authors with the talent and imagination to create his own expansive, fully thought-out fictional universe. So the birds of Blue Jay's crew are each different types of birds, each with characteristics and abilities appropriate to its species: the hulking Chuck-Will's-Widow, for example, is one of the burly heavies of the crew, while Junco, small but fierce and scrappy, makes herself useful as the ship's navigator, and so on. As I mentioned, Blue Jay and his crew are "good" pirates, chaotic and antiauthoritarian to be sure (the empire of the distant, unseen Thrushians is referred to as an authority of which they're particularly unfond), but essentially Robin Hood types. Their adventure begins when the captain himself decides they should rescue a particularly colorful egg from a raccoon—Blue Jay is fond of bright eggs—which eventually hatches to reveal a gosling, Gabriel. Most of the crew is not pleased—Gabriel consumes far more food than any of the other birds, and everyone knows he'll soon grow far too large even to remain on the ship—but Jay insists that he's good luck and must remain. Which sets into motion a sequence of events that include the "sinking" of the Grosbeak; its crew's falling into the hands of a gang of, well, bad pirates led by Jay's cousin, a crow named Teach; and our heroes' taking refuge in a village of lowly sparrows (the peasants of this bird society), whom they rally to rebel against their common crow oppressors, with help from a friendly neighbor mole. The book's characters and its language—particularly the marvelously colorful dialogue, which is grounded in classic pirate-y saltiness yet also has a bird-specific panache of its own (e.g., Jay's favorite expletive: "Crayee! ")—draw the reader in from the first page, and the story flows along at just the right pace to make the book something of a page-turner. Nash's own illustrations, which resemble woodcuts, do what the best chapter-book illustrations always accomplish, filling out the characters even further, and making readers feel we really know them. In the illustrations, Jay and Teach and Gabriel come fully to life, much as Chester Cricket, Tucker Mouse, and Harry Cat will always be those Garth Williams drawings. But it's really the whole world Nash has created that makes The High-Skies Adventures of Blue Jay the Pirate irresistible from the get-go. You get the feeling throughout that you're in good hands with this author—that he's imagined and invented a whole world of bird pirates here, well beyond the frame of this particular book and story. (And while I don't know Nash's intentions, it certainly feels like the opening book in a series—for one thing, we need to find out more about those Thrushians!) It's that, more than anything, that gives Nash's book the imprimatur of an instant classic. We loved it, and hope for a sequel soon. So when I first laid eyes on Tony Preciado and Rhode Montijo's Super Grammar, a comic-book approach to basic grammar, I had high hopes. Which I then immediately tempered. After all, most attempts at making potentially dull subjects "fun," I have found, fail by leaning too far one way or the other: They're either so concerned with getting the educational points across that they aren't much fun at all, or they're lots of fun...without any real educational takeaway to speak of. Still, I figured, leafing through the pages about superheroes (like The Proper Noun and The Preposition) and supervillains (like Comma Splice and The Fragment), it was worth a shot. And turns out: Preciado and Montijo got the balance exactly right, at least for our kid. Dash is very much into graphic novels and comic books of all kinds nowadays (he's even starting to create his own), so Super Grammar was right in his wheelhouse thematically from the start. He saw it, picked it up, and consumed it in a day, without any exhortation from any pesky adults. 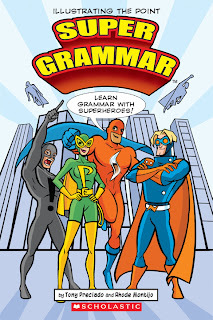 Now, Super Grammar is by no means the most complex of comics—there's no narrative as such, just a series of introductions of the "characters" and examples of their exploits (each of which serves as a grammatical example). The illustrations themselves are what I'd term "classic comic-book style," quite well executed but nothing fancy or especially artsy, either. But the combination gets the job done marvelously. Dash liked Super Grammar so much from the get-go that it's become one of what I call his "lingering" books—it stays out on his desk or nightstand so he can read it again, and again (and again), over a period of weeks. It's even accompanied us on a couple of trips already. And the book does have educational impact, it would appear—Dash appears to have a better conception of what an action verb is, or what purpose a pronoun serves, than he did before, and we've noticed his use of punctuation in particular improving since the book arrived in our home. So while I don't expect that Super Grammar will—or should!—be the end of his education on the subject (one way or another), it's serving exactly the role I'd hoped it might: an easy, low-effort primer on the basics of grammar. And that—well, that's a pretty heroic accomplishment. I'll admit to having been spoiled a bit by They Might Be Giants. It was hard not to be, when a band of which I had already been a longtime fan chose the period when we had our first child to make a marvelous crossover into kids' music—and proceeded to put out four instant classics, still the strongest series of albums in the genre. Even beyond the high quality and the dazzling ease of their transition (beyond subject matter, TMBG didn't really have to change that much about their sound or songwriting), there was also a personal psychological effect: Look, I thought. I'm listening to They Might Be Giants with my infant son. This parenting thing doesn't have to change everything! Of course, I was dead wrong about that—and not only because my subconscious expectations that Husker Du, the Smiths, and Bauhaus would each reunite to put out kids' albums were never fulfilled. (I'm still holding out hope for Smashing Pumpkins.) I learned to accept that life had changed, a lot, and went on to discover a whole slew of great kids' musicians, some with a history of recordings of "adult music" I wasn't previously familiar with (Secret Agent 23 Skidoo, Lunch Money), others with no professional background in music for nonkid audiences at all (Recess Monkey). Ozomatli wouldn't have been the first band I'd have expected to make the move to kids' music—their sound in their heyday had a satisfyingly hard edge, and they're renowned and somewhat revered for their raucous-good-time live shows. But while the songs on OzoKidz are as a whole a gentler than the sum effect of the band's early albums, I was thrilled to find that they're still absolutely true to their sound—the mixing and melding of musical types is still here, as are those fantastic horns (used to great effect on "Moose on the Loose" and "Balloon Fest," among other tracks). The result is an uptempo album with suitable kid lyrical content (as the song titles I just mentioned indicate) that kids find irresistible, while retaining enough of the band's sophisticated sound to make parents happy, too. In addition, thanks to Ozomatli we have now discovered, somewhat to my wife's dismay, that four-year-old Griffin loves bachata. OK, Billy Corgan. You're up. Folks who purchase the new OzoKidz CD at participating independent record stores will receive a FREE OzoKidz chalk box, which contains a link to the bonus track "Vamos a Cantar." Kids (and parents) everywhere are invited to enter the OzoKidz Chalk Art Contest! Entry Details: All you have to do is re-create the OzoKidz album cover art on your driveway or sidewalk—or, for the bonus prize, create a visual representation of the bonus track "Vamos a Cantar" using the OzoKidz chalk. Send us photos of your artwork and we'll pick the best ones. Winners will receive an OzoKidz prize pack! When sending photos, entrants must include the OzoKidz chalk box in the photo. For a list of record stores participating in the chalk-box giveaway, please visit: http://www.recordstoreday.com/Home. Please call your local store to confirm they have the items. 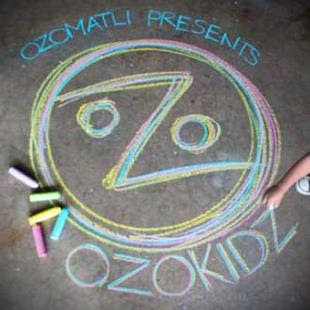 For more information and updates, visit www.ozomatli.com/ozokidz. As I grew older and out of children's chapter books, all those years ago, I kept only a handful of favorites on my bookshelf. I'm not sure I knew why, exactly, even back then—because I thought even as a high school student I might want to refer back to them? Or (deep down) because I wanted to hang on to them for my own kids someday? The reason was certainly sentimental in some way, and at a certain point I stopped winnowing entirely; what survived high school stayed on my shelves into adulthood. These were mostly venerable classics of the kid genre, even at the time—the Narnia series, The Phantom Tollbooth, A Wrinkle in Time—with a few relative newcomers like Ellen Raskin's The Westing Game and Walter Wangerin Jr.'s The Book of the Dun Cow. I didn't care if they were classics, though—these were the books that were in some way or another important to my childhood. I don't always remember exactly why. But these were my books—I remember the surge of feeling I had about each of them very clearly, which must have been at the root of why I kept them. One of the series I kept about which my memory was cloudy was Ursula Le Guin's Earthsea books. Another classic series, of course—being reissued in handsome new hardcover editions this month by Houghton Mifflin, in fact. The feelings I associated with these particular books years later, having mostly forgotten the plotlines, were less of warmth and affection, as I recalled Phantom Tollbooth, say. It was more like a vague sort of awe and reverence. And those aren't feelings that drive nostalgic re-readings. So it had been many years since the Le Guin books had come down off the shelves when my seven-year-old, Dash, started showing interest in books with magical themes beyond Harry Potter. (Not, I should hasten to add, that he finds anything at all lacking in Harry Potter.) 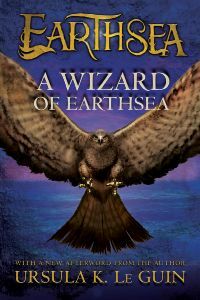 I remembered Earthsea, my memory perhaps jogged by the news of the reissues, and we took my dusty old copy of A Wizard of Earthsea down (both noticing right away that it's sure a lot shorter than a Harry Potter book). It only took a page or two for the vague memories to firm up. And I don't mean just the storyline, though that certainly came back, too: the journey to wisdom of a young, brilliant but arrogant sorcerer-in-training. I don't even mean just the amazing world Le Guin has created as the setting for this series, a land of hundreds of small islands and a full, rich culture that's as vivid and fully imagined as any of the best fantasy worlds of children's literature. Le Guin's is almost certainly the finest writing Dash has encountered since graduating to chapter books, and I could see the effect on him immediately—he was quietly fascinated (unusual, since his enthusiasm about books is usually more amped-up and vocal), with a sort of reverent awe that was very familiar. I think the Earthsea books may have similarly awakened me to a level of writing I'd previously been unaware of, when I first encountered them, which would more than explain their staying power on my shelves all these years. Maybe Dash will feel the same way about them someday. We always feel a bit guilty when we let our two sons sit watching videos for long periods of time. But let's face it: Sometimes it's unavoidable, when we have to be certain they'll be completely engrossed in something while we repaint the porch, or install the new ceiling fan, or figure out how the new oven's convection feature actually works. 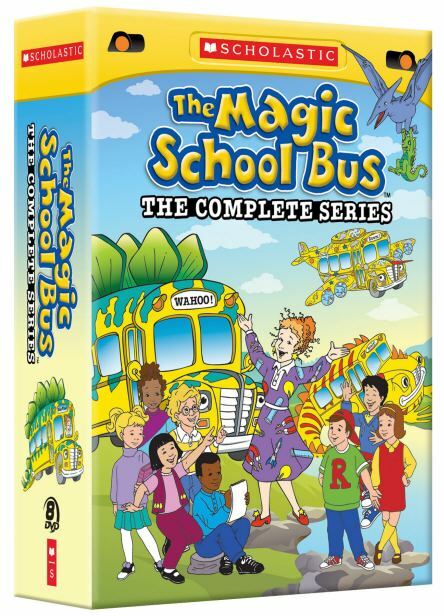 The shows, for those unfamiliar even with the books, follow the adventures of the class of Ms. Frizzle, who with the aid of the wonder vehicle of the title leads the kids through all sorts of expeditions into scientific knowledge. The bus in question being magical, this often involves some improbable journeys and transformations—to learn about bats' echolocation, what could be better than becoming a bat, after all?—as well as not a few close calls, until the unflappable Ms. Frizzle calmly puts everything right again. It's sort of like Scooby-Doo crossed with Carl Sagan and Jacques Cousteau, and the fact that Ms. Frizzle is voiced by the great Lily Tomlin (clearly enjoying herself quite a bit) is the icing on top.